The 8x8 L'application de bureau Virtual Office provides Instant Messaging (IM) with your company contacts. You can chat with one contact or with multiple contacts, whether in the same conversation or separate conversations. You can type a message at any time, but for interactive messaging, both contacts must be online. You can also view message history and export these conversations as text files. -In version 4.6 of the app: By default, the new chat view is enabled. To access the old chat view, clear the Enable Beta Conversation View check box under Settings > Messages. -In version 4.5 of the app: You have access only to the old chat view. Note: Instant messaging is available to you if your phone system administrator has enabled IM. How do I read a new IM? In the navigation menu, see whether you have any unread chat messages under the Messages tab. Click the messages to view them. You can leave chat messages for Virtual Office users who are currently not logged in. Users can also leave you chat messages when you are not logged in. How do I send an IM? From the navigation menu, open the Messages tab. Scroll through the list of past messages, and select a contact to send a message to. Search for a contact by name, number, or group. Click below the navigation menu. You are prompted to enter a contact name or phone number. The Virtual Office Messages window pops up. Compose the message, and press the Enter key. From the navigation menu, open the Contacts tab. Select a contact from the directory, and click . How do I start a phone call from my messages? Click at the top of the chat window. Phone calling is possible with other Virtual Office users on the same phone system who are also logged in at the same time as you. How do I start a video call from my messages? Video chat is possible with other Virtual Office users on the same phone system who are also logged in at the same time as you. On starting video chat, your system opens a window that allows you to use the proper plug-in and select which video camera you wish to use. Video chat does not allow audio. How do I start a Conférence Virtual Office from my messages? Starting a Conférence Virtual Office is possible with other Virtual Office users on the same phone system who are also logged in at the same time as you. Note: Conférences Virtual Office is only available for Virtual Office Pro users. How do I start a group chat from my messages? From a one-on-one chat session, click (in the old chat view) or (in the new chat view) at the top of the chat window. A contact search box pops up. (In version 4.6) Enter the name or extension of the contact to add, and click Start Group Chat. (In version 4.5) Enter the name or extension of the contact to add. Group chat is possible with other Virtual Office users on the same phone system who are also logged in at the same time as you. You cannot add contacts who are currently logged off or only logged in to the L'application mobile Virtual Office, or those who are imported from Google. If one or more of the desired users are offline, you cannot start a group chat. How do I include emojis in a message? In the bottom-right corner of the chat window, click the emoji (on Windows 7, this appears as ) to open the list of emojis. Note: Emojis may be limited based on your OS character set. From the list, click an emoji while writing a message to insert it into the text. Note: Emojis are available only starting with version 4.6 of the L'application de bureau Virtual Office. How do I review past messages? Scroll through the list of messages. Scroll further down to load older messages. Loading may take some time. Click the chat you want to review. 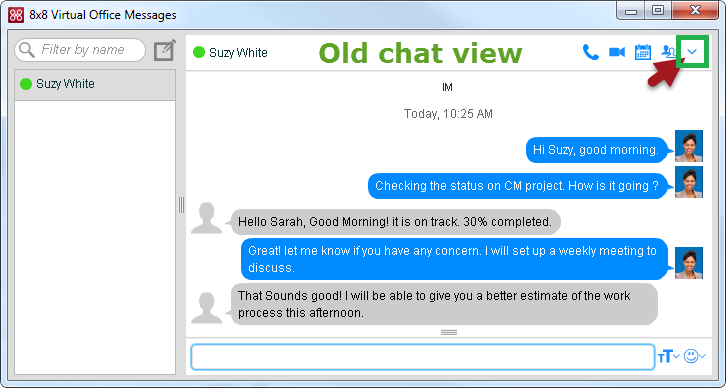 You can also open and view past chats by clicking next to a contact under the Contacts tab, and scrolling up through the chat to load older messages with that contact. How do I enable or disable sound notifications? Select Virtual Office >Settings from the L'application de bureau Virtual Office menu. Under Notifications > On Incoming IM/SMS, select the Play Sound check box to enable sound notifications when chat messages are received. This option is enabled by default. To disable sound notifications, clear the check box. How do I bring the Messages window to front? Under Notifications > On Incoming IM/SMS, select the Pop to Front check box to bring a chat window to the front of your screen on receiving an incoming chat message, eliminating the need to open the chat window manually for a new message. How do I chat with my imported Google contacts? This feature must be enabled by your phone system administrator. Select the Google check box. In the window that pops up, enter your Google login and password. In the Contacts tab, select the Login to Google Talk check box. -Logging in to your Gmail or GTalk account to activate your L'application de bureau Virtual Office contacts brings those contacts into your 8x8 Online account. -When you chat from your L'application de bureau Virtual Office account, your name from your Google account is presented to your Google contacts. The name on your 8x8 account does not show during the chat with Google contacts.